What is it? A lightweight water-based setting spray shields your flawless look from temperature variations, sweat and air pollution, leaving your skin looking amazing without having to constantly reapply your makeup. Perfect for professional photography, make-up artists and all make-up enthusiasts. The application: Application only takes all of about three seconds. Hold bottle 6 inches away from your face and mist evenly, making sure to cover the whole desired area. Lightly dab off excess spray with tissue (I never need to do this), and air dry for a perfect finish. 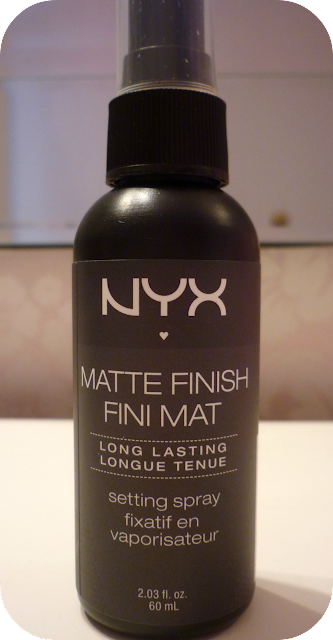 The results: It really does give a lovely, fresh matte finish. My make-up lasts all day too. It's more effective used when wearing a lot of make-up though (foundation, blusher etc). Perfect for our current humid atmosphere and season change as it keeps everything in place! Pros: Quick to apply, refreshing when just applied and no need to re-apply makeup throughout the day. Cons: The mist itself could be a little less thick, and it doesn't have a particularly pleasant smell. Have you tried any NYX products?